This is the one of a series of eight musicians I painted in a two week period during the summer of 2008. The harp has been in existence for millenia, and for good reason. It possesses a delicate, ethereal sound, and is capable of playing bass, chords and melody simultaneously, as a piano does. It is equally comfortable in the role of solo performance or accompaniment, especially to singers and singer/songwriters. Visually it is one of the most beautiful musical icons with its carved soundbox, decorated soundboard, curled crown and irregular triangular shape. The modern harp is a very challenging instrument to write for because of it complex pedaling requirements. 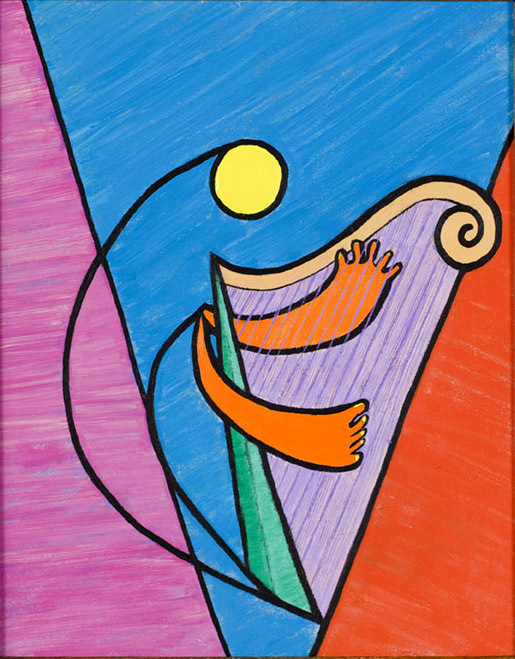 The background colors for Harpist , as with the entire ‘Musician series, are inspired by Henri Matisse.